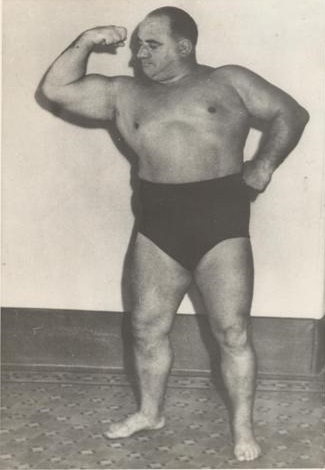 Bartolomeo "Bert" Assirati, was a multiple time British Heavyweight Champion and, posthumously, one of the few English wrestlers to be a member of the Wrestling Observer Newsletter Hall of Fame. 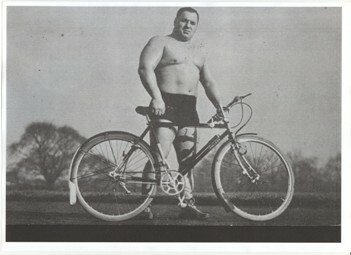 He was known for displaying various feats of strength, including setting a British record in 1938 by lying on his back, and pulling over at arms length a two hundred pound barbell. At 240 pounds, Assirati was one of the heaviest men to perform the iron cross. 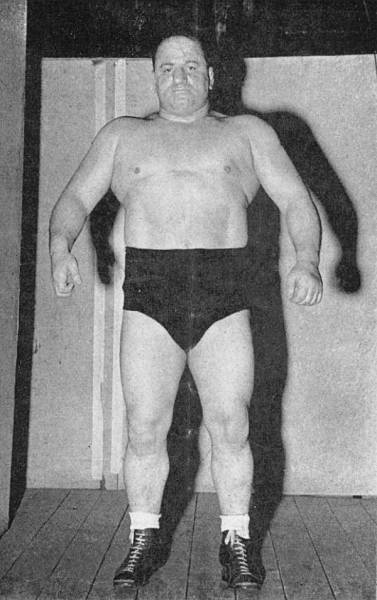 Bert Assirati was short and stocky for a heavyweight. but therein lie`s his success as a wrestler. Because of his size, his agility and his knowledge of the various holds and leverages, there have been few wrestlers capable of beating him. Take a look at his record. In a page allotted to foreign mat stars that he has defeated are the names of Hank Osborne (U.S.A.), Mike Brendal (Hungary), Michael Leoni (Italy), Henri Stoeff (Bulgaria), Oscar Nygren (Sweden), Nicoly Kawariani (Russia), “Sailor” Jack Arnold (U.S.A.), Renato Gardini (Italy), Leo Jensen (Canada), Steve Savage (U.S.A.), and Stefan Novotny of (Hungary). These are just a few. To name the complete lot would take a number of pages. Born in London, Assirati stood at five feet six inches in his bare feet and weighed around 16 stone mark. Despite his weight and stockiness, his opponents found him a difficult man to hold in any one spot for very long. 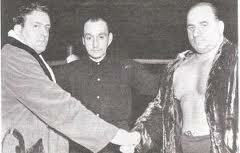 Henri Deglane in Paris, tried for one hour to pin the slippery Londoner, but the final decision was a draw. Deglane was a former heavyweight champion of the world. The fact that he spent much of his early life as a music-hall acrobat assisted Assirati in his climb to the pinnacle of wrestling success. For a number of years he was part of the tumbling act of Mello and Nello, feature attraction on variety bills in this country and on the continent. His amateur career began at the famous Ashdown Wrestling Club. Here he trained for amateur competition with the same vigour that he carried out with his wrestling schedule which consisted of two hours daily wrestling in the gymnasium. Atholl Oakley, the genius behind early British wrestling, is credited with the discovery of the champion. Peter Gotz and Jack Carroll, champions of the past, were responsible for instructing him in the tricks of the professional game and a tour of the United States prepared Assirati to take his place at the head of the sport in this country. According to the record books, Douglas Clark, recognised as the British champion, retired and the title became open. At Belle Vue Stadium, Manchester, Bert Assirati faced George Gregory, Bolton, and defeated him to become British heavyweight champion. With his claim to the British title firmly secure, Assirati sought world honours by entering the tournaments at Harringay. His defeat of Ivor Martinsen, Danish European titlist, is now history. In making every endeavour to obtain this World Title ambition, Assirati had trained hard. He had taken full advantage of the fine summers we had. He paid regular visits to the Welsh Harp. This open space is an ideal spot in N.W. London which provides good training, swimming and sun bathing facilities. The results of this training campaign is most noticeable when Assirati stripped in preparation to face his opponent. His form had been very good against the toughest matmen we had in this country, and this standard of form was retained against the influx of foreign grapplers that visited this country. In contests Assirati had to deal with opponents whose methods of attack in trying to overcome this powerful wrestler have been varied and hard. However in all due respects to the opposition, it had to be a wrestler of exceptional ability to master the British Champion. In 1950, Assirati left the British Wrestling Association to wrestle in India. As a result, he was stripped of the British Heavyweight Championship. He returned to Europe and won back the European Heavyweight Championship in 1952. Once again, he left for India and was forced to vacate the title In 1955, he won his final championship by defeating Ernie Baldwin for the vacant British Heavyweight Championship. He was stripped of the title in 1958 by Joint Promotions, the governing body, although the British Wrestling Federation (BWF) continued to recognize him as their champion. In 1960, Assirati sustained an injury, and the BWF stripped him of the title as well. Later in his life, Bert worked as doorman at the Ebbisham Halls in Epsom, Surrey, especially on the dance nights when many of the top acts of the sixties were playing there. He used to enjoy showing a party trick of placing a metal drink cap between each of the fingers on both hands and completely crush them all at once. Bert Assirati died on the 31st August 1990 and his ashes are buried together with his beloved wife Marjorie in the garden of the British Wrestlers Reunions home at The Bridges Public House in Kent. Bert Assirati will always be remembered as one, if not the, greatest heavyweight wrestlers of all time and his memory will always live on. Thanks to Mike Hallinan, Wrestling Historian for this information.